Awww! So good to see her looking better. She's just *glowing* with all the love and good thoughts everyone's sending her! She is quite the Angel. Great pictures of her! Wonderful to see her looking better. She is queen of the hill!!!!! Queen of the Cone = Queen of the Cute! Oooooh that wee tail....the cute! the cute! Her her aww, her teeny little tail just slays me! I was not expecting that on such a floofy kitten. Adorable! Hail to the Queen!! What a joy to see wee Wylla having fun! why is your tale so little? I think Wylla is thinking "Design fail? Well, I think its more that Charlene Butterbean and Audrey are just not quite as graceful as the QOTC. This toy works just fine!" All kitty-cats are beautiful, but little Wylla is really very special. May the sun shine on her forever and ever. xoxo tiny fluffy one. Her floof is almost longer than her whiskers! Silly kitten. 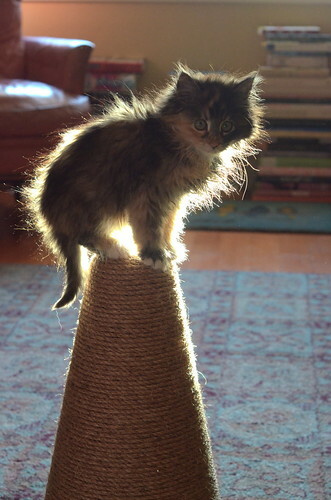 I bet she is one of those kittens who doesn't really jump up on anything -- they jump above it, levitate for a split second in the air, and then slowly descend. Our 9 year old "kitten" still does that -- gravity defiance at it's best, and always amazing. for some cats, gravity is optional. Wylla is one of those cats. 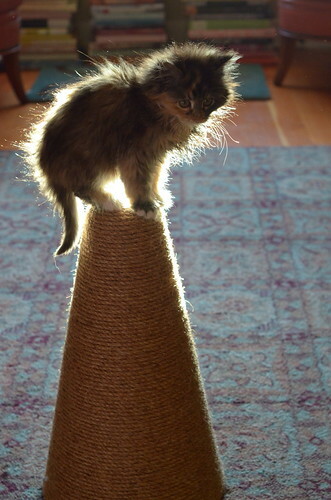 Wylla says "I do not see a design flaw in this throne, I mean cone..."
A little pedestal all her own. As it should be. Hope you're getting better, baby girl! Every picture you've posted of her just makes me melt... but these of her back-lit floof has me in a puddle! I especially love her "silver lining"! She is definitely Queen material! Backlit floofy girl. So adorable! Her Royal Highness, Queen Wylla, the Floofy! Pictured here on her Cone Throne! What a kitten! I adore her floofiness. Keep healing and hopefully thriving Miss Wylla! Wylla, you are the Queen of Hearts! You have surely stolen mine! Please be all well baby girl. Is Audrey the court jester? every photo you post just serves to fill my heart with joy joy joy!! 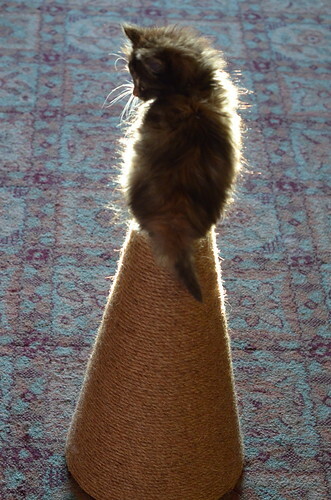 What light through yonder fuzzball breaks? It is the east, and Wylla is the sun! We can see how tiny these kittens are. Would LOVE to see Miss Butterbean and Wylla. What a bath workout for Charlene--all that fluff! Obviously, this cone was made just for Miss Wylla! Your photography is wonderful, Laurie. Of course, Wylla's itty bitty floof and cuteness -- that's absolutely uncontested. Oh my, but she is a beauty! We'll see if she has trouble when she puts on some weight now that her tummy is better... If she starts knocking the cone over like Bean and Audrey, Wylla will become the cuter version of Grumpy Cat. Both the girls have such teeny tails! Do kittens usually have short tails until they grow up, or are these two remarkably exceptionally special?? Oh, Wylla, you're such a beautiful backlit baby! Ohmygoodness--look at those great big eyes! All hail QOTC! The cute-o-meter went off the scale! Always so serious! But still so cute! What a floofball!